At the top of the Sacred Hill, which is reached after climbing over 70 steps and crossing an open patio filled with scattered walls built in the purest manner and exuding a clean and uniform esthetic, you’ll find the Intihuatana- a large sculptured obelisk, sanded at different levels and ending up at a point in the shape of four-sided prism measuring 36 centimeters in height (14 inches approximately). The four edges of the prism point towards the four cardinal points. The Intihuatana, which in Quechuan means “The Place where the Sun is Tied,” is the central piece (and therefore also indispensable) in a very complex system of astronomy-based measurements, which served the Incas to help them determine when would be the beginning and ending of their agricultural year. This served as both a social function, just as much as a religious one. In studies done at an earlier date, when it’s function was discovered within the astrological ideas of the Incas, it was finally understood that, by the sun shining on the very center of the structure, a shadow would project from it. This shadow had a precision very similar to that of the astrological instruments used at that time, to determine the exact position of the sun in space. The most important dates for celebrations in the culture of the Incan Empire where determined according to the measurements made from the shadows cast by the Intihuatana, which would mark with precision the exact moment of the winter solstice, which in turn indicated the beginning of the Inti Raymi celebrations. The Inti Raymi, or La Fiesta del Sol (the Sun Festival) was the Incan’s most important religious and social ceremony During this festival, various rituals took place all directed in worship to the sun, asking it to not desert the Incans during their agricultural year, as their villages depended on the yield of these crops. 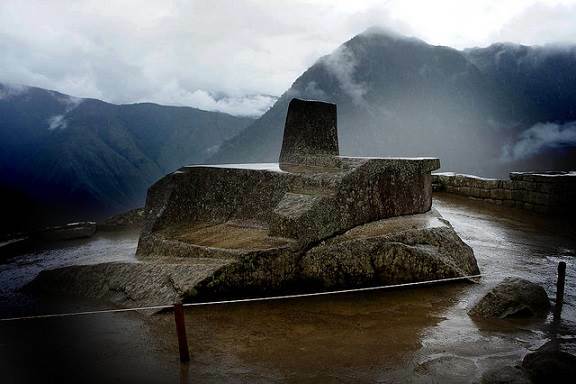 In order to assure the sun’s cooperation, they would symbolically “tie” it to the Intihuatana. To do so, the High Priest would preside over a public ritual where offerings were made to the Sun while the priest held his hands over the shadows of the sun on the rock.